The first version of the game was released in 1989 for the PC, as John Madden Football. The first console version (and the version that made it a top-selling franchise) for the Sega Genesis followed in 1990 with a Super Nintendo version available a year later. EA Sports has released annual updates for all versions since 1991's John Madden Football '92. The series gained full NFL licensing and became known as Madden NFL with 1993's Madden NFL '94; NFL players licenses came two years later. The game is named after John Madden, a well-known football commentator and formerly a successful Super Bowl winning professional football coach during the 1970s with the Oakland Raiders. Madden insisted that he would only give his endorsement to a game that was as close to real life football as possible. The game has grown, refined and matured over the years, adding many new features. Among these is voice commentary, allowing players or watchers to hear the game being called as if it were a real game on TV. The commentary is by John Madden teamed with his regular broadcast partner, which meant Pat Summerall until he retired; the role is now filled by Al Michaels, John's regular broadcast partner on Monday Night Football. The original version of the game was commissioned by EA founder Trip Hawkins in 1984, and originally ran on an Apple II. EA had just shipped the hit Dr. J and Larry Bird Go One on One and would soon begin work on Earl Weaver Baseball and World Tour Golf, which together were the foundation for the EA Sports line of video games. The Apple II was not fast enough to show all the players running in real formations on the field. Madden personally rejected the initial proposed build because there were only seven players on each team. After several years of unsuccessful experiments the game finally shipped in the late 1980s and did not sell well. When the Sega Genesis gained popularity in the early 1990s, EA tried again. Producer Richard Hilleman brought in veteran sports game designer Scott Orr, who had founded 1980s Commodore 64 game publisher GameStar and had led the design of their best-selling sports games. The team of Orr and Hilleman designed and led the development of what is today still recognizable as the modern Madden Football, the highest revenue-generating video game series in North America in game history. Early versions of Madden were created by outside studios (including Park Place Productions and Stormfront Studios) but by the late 1990s development was centralized internally at EA Tiburon in Orlando, Florida. There are multiple modes of play, from a quick head-to-head game to running a team for a whole season or even multiple seasons. Online play, which was a new feature for Madden NFL 2003 was only available for users of the PlayStation 2 console or a Microsoft Windows PC until earlier this year. At E3 2004, Microsoft and EA Sports released a press statement announcing that games made from July on will now be Xbox Live-enabled. 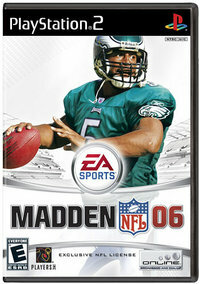 In August of 2004, EA Sports released Madden NFL 2005 and thus became a fierce competitor in the Xbox Live Community. Also, starting with Madden 2004, EA Sports created the new "Play Maker" tool, using the right analog joystick found on many controllers. This allows the players to make pre-snap route adjustments, as well as defensive alignment adjustments. In Madden 2005, EA Sports further utilized the right analog joystick by creating the "Hit Stick", and option on defense that allows the controlled player to make big hits that can cause fumbles. 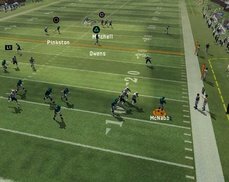 In the most recent edition to the Madden series, Madden 06, the truck stick was introduced. This feature allows the offensive player to lower his shoulder and break a tackle, or back juke to avoid one. Another new feature is the 'Superstar Mode', which allows the player to take control of a Rookie, and progress through their career. This includes an IQ test, the NFL draft, hiring an agent, and other aspects of a superstar's life. On December 13, 2004, EA Sports announced it had secured exclusive rights to the NFL for the subsequent five years, precluding any other game company from selling a football game using NFL players, teams, stadiums or other licenses. Prior to 2000, all of the Madden NFL game box covers prominently featured John Madden only. When EA started to have NFL players on the cover of the Madden NFL games, some people speculate there was a "Madden curse" after noticing a pattern when Atlanta Falcons' star player, Michael Vick was injured during the 2003 preseason after appearing on the cover of Madden 2004. Some of the people that believed in the curse stated that the player featured on the box would get injured or simply have a weak season. The first NFL player to be on a Madden NFL cover was Barry Sanders in 1999, on the 2000 version of the game. He shared the cover with the customary picture of John Madden. However, a week before training camp began in 1999, he abruptly retired, ending his career and leaving the Detroit Lions without their star running back of the previous 10 years. Sanders' part in the curse is debated because he is not solely pictured on the box. Eddie George of the Tennessee Titans, who graced the 2001 box, was the second cursed player. He was cursed by bobbling a pass in the playoffs, which was then picked by Ray Lewis, who returned the ball for a touchdown. He was also injured the following year. George, who regularly averaged nearly 4 yards per carry in his first five seasons, averaged only 3 yards per carry in the 2001 season, and hasn't broken 3.5 yards since.